Pinwheel is the boss that lies in the depths of The Catacombs. It is located beyond a fog wall, across the valley floor at the bottom of the Catacombs that is being patrolled by the Wheel Skeletons. After entering the boss fog, you approach what appears to be a gigantic tomb with the lid ajar, allowing you to drop down into Pinwheel's lair and trigger a cutscene. 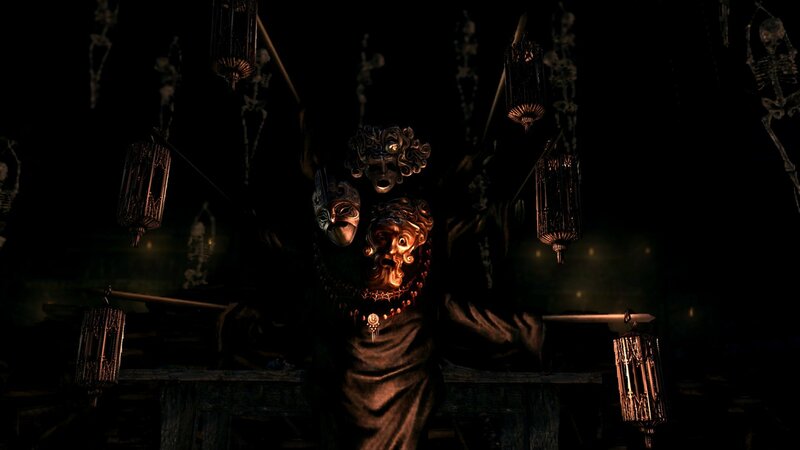 First seen in the official Preview, Pinwheel appears to be a necromancer body of sorts being controlled by three magically influenced masks. It awards one of its three masks when killed, and the others may be purchased from an NPC vendor first found in the Tomb of the Giants, after he relocates to Firelink Shrine. Once defeated, access to the Tomb of Giants will be granted by way of a ladder in the far corner of Pinwheel's lair. Also upon defeat, the Rite of Kindling will be automatically obtained, thus allowing the kindling bonfires to an even greater degree and permitting the player to obtain up to 20 estus flasks from a fully kindled bonfire. Pinwheel mostly just makes copies of itself and shoots fireballs at you. In addition, it has a flamethrower attack of sorts, which also seems to be a tell when trying to discern him from his copies (they just shoot fireballs). The fight is pretty similar to the Fool's Idol boss in Demons Souls, except with fireball attacks instead of soul arrows and less places for you to take cover. Pinwheel is generally considered the weakest area Boss in the game, although weakness in Dark Souls is relative. Most players will take damage while dropping into his lair and triggering the opening cutscene, and may have a natural instinct to pause to heal themselves when the fight starts. However, it is generally more advisable to simply run across the room towards Pinwheel and begin attacking it immediately. With sufficient speed, pressure, and damage output, victory can be obtained very quickly. Pinwheel generally becomes more dangerous if left alone, as it will start to make copies of itself which begin shooting fireballs at you from different directions. As long as you don't let yourself get too surrounded, the fireballs are pretty easy to block and/or dodge. If you're feeling pressure, feel free to swing at a few copies to eliminate them (1-2 hits usually), but so long as you keep whacking the main body Pinwheel should die fairly quickly. A good fire resist shield such as a black knight shield or the dragon crest shield can also be helpful. In addition to the flamethrower tell, the main Pinwheel also casts a purple spell when copying itself - as in he is surrounded by a purple aura while casting the spell. Pinwheel is vulnerable to pyromancy, which can be a good strategy choice for any player. Equip your pyromancy spells, and be patient and wait for Pinwheel to settle down after teleporting. Eight fireballs from level one pyromancy should take it down to 1/3 its health. Combustion, Great Combustion, or one of the area of effect firestorm-type pyromancies can also be extremely effective. Similarly, using a fire or chaos weapon in both hands can take down Pinwheel's health very quickly. If you're really having trouble, while going down through the catacombs, it is possible to drop down onto a platform with a summon sign on it provided you are in Human form. 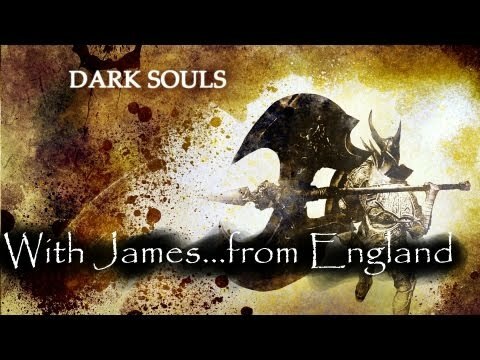 The location to drop down onto the platform is just beside a broken bridge on the lowest level above the Catacombs floor, near the doorway leading into the tomb area containing a Titanite Demon and the coffin for the Gravelord Covenant. Carefully walk off the edge onto the area below, and summon Paladin Leeroy ("Jenkins"). This NPC summon is quite helpful against the many bonewheel skeletons on the Catacombs floor below, and for fighting Pinwheel. You just need to evade and block the attacks of the Pinwheels, and let the NPC do the job. Paladin Leeroy can beat the Pinwheel with 3 hits.